Reports from the Field — Atlas Systems, Inc.
Well, another new year has barely started, and already another ALA Midwinter Meeting is behind us. Many Atlas staff made the trek across the country to Seattle, including yours truly. As always, we were busy from the moment we touched down at Sea-Tac Airport, attending meetings, talking to customers, and keeping current with developments in the field of librarianship. Friday evening was for walking the exhibits and seeing old friends and colleagues. Saturday morning got off to an early start with the RUSA STARS All Committee Meeting, followed closely by the RUSA STARS ILL discussion Group. Then it was off to our “Office Hours” at the Tap House Grill. 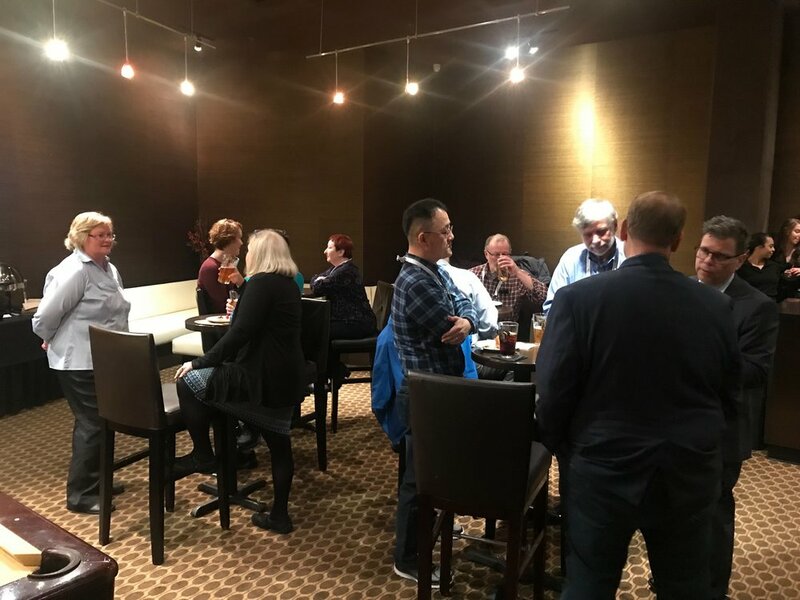 For the past several Midwinter Meetings we escaped the booth and invited our customers and friends to visit with us offsite. At Midwinter, no booth equals more quality time with our customers, and we weren’t disappointed. It didn’t hurt that there were great appetizers and 160 beers on tap! Lots of folks came and went from noon till five as we discussed ILLiad, Aeon, Ares and, in many cases, life in general. It was indeed an enjoyable time and we look forward to repeating it soon. Sunday started somewhat slower, with various meetings and visits to the exhibits. However, things picked up at 4:30 in the afternoon with the OCLC Resource Sharing Users Group. 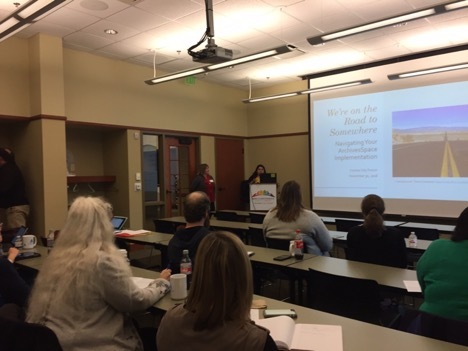 Those attending were given an update on recent and upcoming changes to OCLC Delivery Services and related products, including an ILLiad update by Stephanie Spires, Chief Operations and Service Officer here at Atlas Systems. Next up was the RUSA STARS Midwinter Meetup at the Mexican-themed restaurant Cactus. Good conversation, food, and drink – who could ask for more? But our time in Seattle was quickly winding down. Up way before dawn (at least it was West Coast time) on Monday, out the door, and on the plane home. Another Midwinter Meeting, another satisfying and productive trip. So, what’s up next? ALA Annual in Washington of course. Look for us there in the exhibit hall. Details will be forthcoming. Until then we look forward to hearing from you and perhaps seeing you at one of the other events we will be attending throughout the Spring. 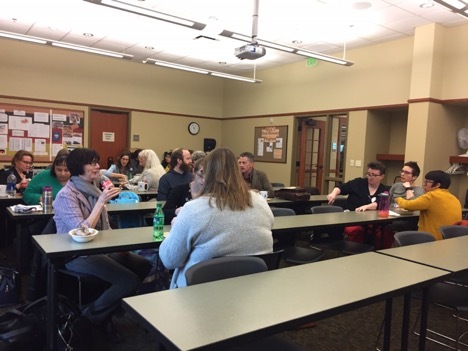 The ArchivesSpace members community continues its efforts with organizing regional user forums, most recently at the Midwest Genealogy Center, which is part of the Mid-Continent Public Library system, in Independence, Missouri. Attendees could choose from two morning workshops – one on controlling data in ArchivesSpace via authority records and controlled vocabulary lists. This workshop was taught by Miloche Kottman, Head of Cataloging and Archival Processing at the University of Kansas. Miloche had great tips to offer about how to handle certain fields. It was the type of ‘boots on the ground’ advice not always included in formal written documentation. - ArchivesSpace will only recognize Agent duplicates if the Source, Rules, and Name fields are exactly the same in another record. If any one of those fields is different, the records will not be considered duplicates. - If the LCNAF import plugin doesn’t seem to be working, and you’re not sure if it is ArchivesSpace or the Library of Congress service, copy and paste the LCNAF URL into a browser. If the page won’t open in a browser, then it’s on the Library of Congress side. The Library of Congress service is typically down between Christmas and New Year’s. If you want to merge two or more Agent records, first open the record that you want to keep. If you want to merge Controlled Vocabulary values, first open the record that you want to delete. - If you use the default values template for resource records, your default values will not apply if you create resource records by spawning from an accession record. In the afternoon, everyone came together for what evolved into a lively interactive discussion on implementing ArchivesSpace. The conversation was started by Jenna Silver-Baustian, Processing Librarian at the University of Iowa. She spoke about her legacy data project, where they have three different formats of finding aids that they are working on getting into ArchivesSpace. They have found Harvard’s ArchivesSpace Excel Import plugin (https://github.com/harvard-library/aspace-import-excel) to be an invaluable tool, as it allows for the import of archival objects using a CSV file, instead of having to convert to EAD first. There was much discussion about how the plugin actually worked, and Christine Kim, the Community Engagement Coordinator at ArchivesSpace, demoed how to use set up a file and import it, using the plugin. Next, Madeline Sheldon, Member Representative at LYRASIS, and myself presented on ideas for implementing ArchivesSpace, beginning with setting measurable goals, creating a project plan, options for importing legacy data, resources for training and learning, and community tools, including the ArchivesSpace Awesome List and the JIRA page for submitting bugs and product improvement requests. We were scheduled for break-out discussions after that, but the group remained together and continued their interactive discussions with presenters as they talked about implementing ArchivesSpace at their institutions, where many attendees functioned as lone arrangers, and struggled with getting ArchivesSpace up and running while handling their daily job duties. One of the most helpful ideas came from Todd Zitlow, at the Concordia Historical Institute. He discussed how they divided the ArchivesSpace implementation into phases. They started with describing their most requested materials at a collection level. Phase 2 was to go back and add series-level descriptions. Phase 3 was then to add folder, and occasionally, item-level descriptions. These phases helped them plan more effectively for budgeting and staff availability, as well as gain stakeholder buy-in as more resource descriptions became discoverable online. 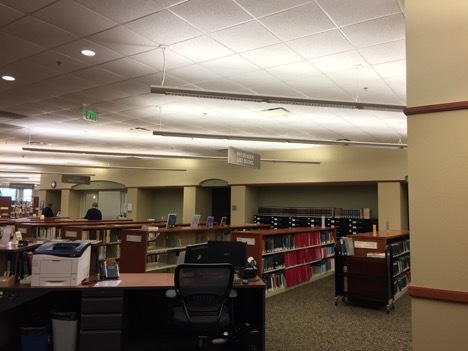 November 13th, right before the Access Services Conference in Atlanta, Georgia, I was able to tour the Library Service Center(LSC) that houses the shared collections of Emory University and Georgia Tech University libraries. It was an unassuming, lovely one story facility from the outside, but once inside you realize that, like the Tardis, it is bigger on the inside! We toured the processing areas and then went on to see the stacks of high density shelving. 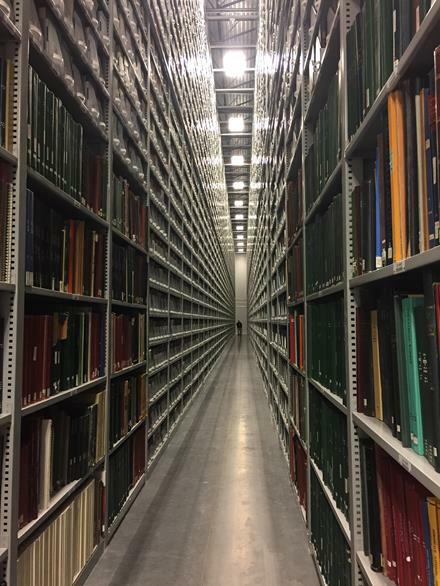 The shelves were 32 feet high, and Chris Britt-Rogers showed us how long each aisle is by walking to the end for this photo. It's well over a 150 feet long! 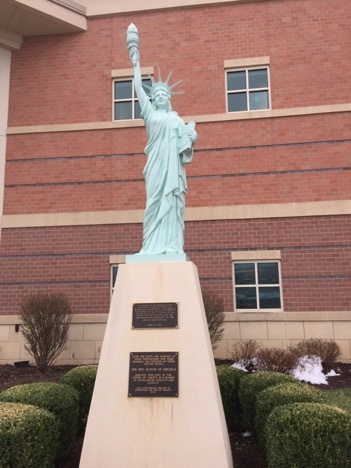 We spent time at the LSC talking about how implementing the Electronic Delivery Utility would save staff time and improve efficiency in ILL Lending. We also talked about getting ILLiad working with their Storage Management software. I was even able to talk with their vendor at the conference that week about it, and they are already working with our developers! During my Atlanta visit I was also able to meet with ILL and Reserves staff at Emory and Georgia Tech to talk about ILLiad and Ares as well. Lots of ideas for enhancements, as well as being able to help answer questions they'd had about their ILLiad and Ares software. All in all, I'd say all our brains were very full by the end of our visits, and then we were able to spend the next two days at the conference learning even more. This is one of my favorite conferences, and I love having the opportunity to visit two of our valued ILLiad and Ares sites at the same time!